Just Catamarans is happy to announce the sale of a Lagoon 420 Owners Version Catamaran, built in 2009. SALT WATER LADY was sold by Jim Ross. The Van Peteghem & Lauriot Prevost designed Owners version Lagoon was never chartered, powered with twin Yanmar engines. Priority has been accorded to comfort when designing the interior of the Lagoon 420. The light oak Alpi woodwork and the laminated wenge floor give a modern and relaxing feel. Access into the saloon from the cockpit through a sliding glass door on the same level. The saloon set with the varnished wood coffee table that can be swapped with the large wooden cockpit table (one big and one small table). The longitudinal galley opens directly on the cockpit. 3 ring gas hob, oven, fridge, numerous lockers, double sink… all features to make the galley a friendly and practical area. Lying in Maryland, SALT WATER LADY was asking $370,000. 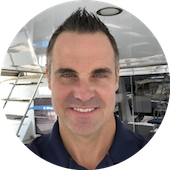 Contact Jim Ross to sell your Catamaran with Just Catamarans.